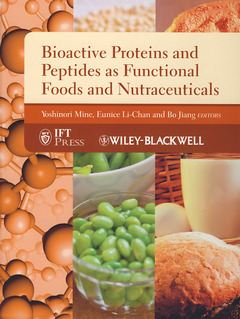 1 Biologically Active Food Proteins and Peptides in Health: An Overview (Yoshinori Mine, Eunice C.Y. Li-Chan, and Bo Jiang). PART 2 Functions of Biologically Active Proteins and Peptides. 2 Anti-inflammatory/Oxidative Stress Proteins and Peptides (Denise Young and Yoshinori Mine). 3 Antioxidant Peptides (Youling L Xiong). 4 Antihypertensive Peptides and Their Underlying Mechanisms (Toshiro Matsui and Mitsuru Tanaka). 5 Food Protein-Derived Peptides as Calmodulin Inhibitors (Rotimi E. Aluko). 6 Soy Protein for the Metabolic Syndrome (Cristina Martínez-Villaluenga and Elvira González de Mejía). 7 Amyloidogenic Proteins and Peptides (Soichiro Nakamura, Takanobu Owaki, Yuki Maeda, Shigeru Katayama, and Kosuke Nakamura). 8 Peptide-Based Immunotherapy for Food Allergy (Marie Yang and Yoshinori Mine). 9 Gamma-Aminobutyric Acid (Bo Jiang, Yuanxin Fu, and Tao Zhang). 10 Food Proteins or Their Hydrolysates as Regulators of Satiety (Martin Foltz, Mylene Portier, and Daniel Tomé). PART 3 Examples of Food Proteins and Peptides with Biological Activity. 11 Health-Promoting Proteins and Peptides in Colostrum and Whey (Hannu J. Korhonen). 12 Functional Food Products with Antihypertensive Effects (Naoyuki Yamamoto). 13 Secreted Lactoferrin and Lactoferrin-Related Peptides: Insight in Structure and Biological Functions (Dominique Legrand, Annick Pierce, and Joël Mazurier). 14 Bioactive Peptides and Proteins from Fish Muscle and Collagen (Nazlin K. Howell and Chitundu Kasase). 15 Animal Muscle-Based Bioactive Peptides (Jennifer Kovacs-Nolan and Yoshinori Mine). 16 Processing and Functionality of Rice Bran Proteins and Peptides (Rashida Ali, Frederick F. Shih, and Mian Nadeem Riaz). 17 Bioactive Proteins and Peptides from Egg Proteins (Jianping Wu, Kaustav Majumder, and Kristen Gibbons). 18 Soy Peptides as Functional Food Materials (Toshihiro Nakamori). 19 Bioactivity of Proteins and Peptides from Peas (Pisum sativum, Vigna unguiculata, and Cicer arietinum L) (Bo Jiang, Wokadala C. Obiro, Yanhong Li, Tao Zhang, and Wanmeng Mu). 20 Wheat Proteins and Peptides (Hitomi Kumagai). PART 4 Recent Advances in Bioactive Peptide Analysis for Food Application. 21 Peptidomics for Bioactive Peptide Analysis (Icy D'Siva and Yoshinori Mine). 22 In silico Analysis of Bioactive Peptides (Marta Dziuba and Bartlomiej Dziuba). 23 Flavor-Active Properties of Amino Acids, Peptides, and Proteins (Eunice C.Y. Li-Chan and Imelda W.Y. Cheung). 24 Controlled Release and Delivery Technology of Biologically Active Proteins and Peptides (Idit Amar-Yuli, Abraham Aserin, and Nissim Garti).